Daylilies are one of our summer superstars. This year with all our rain, they are particularly spectacular! 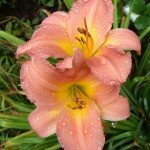 Daylilies are hardy, reliable and long-lived. We carry hybridized varieties chosen for their striking flowers, sturdy stems and larger blooms. Many types will re-bloom for you. They come in a range of sizes from short, front-of-the-border plants to tall, dramatic thrillers. With early, mid and late blooming types, you can extend your daylily enjoyment from late May through September. Daylilies bloom best in full sun, but will tolerate part shade. They can handle moist to dry soils and have few, if any, pest and disease problems. Since the blossoms only last a day, deadheading will keep the plants looking tidy and will encourage longer flowering on re-blooming types. Hybrid daylilies may require dividing about every four to five years to prevent over-crowding. Daylilies are great plants to weave through perennial beds. Pair them with daisies, Russian sage, Jupiter’s beard, monarda, geraniums and calamint for brilliant summer color. Add one of the new smaller panicle hydrangeas like ‘Little Lime’ or ‘Bobo’ for structure and big summer flowers.